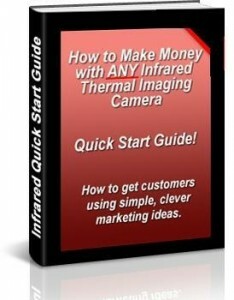 Are you looking to start a thermography business? The good news is that we have been through the ups and downs of getting started in the IR business, and it’s very easy to get ‘deflated’ when you don’t get work right away. Having a business plan for your thermal imaging venture is certainly important, but don’t get too bogged down in the detail because you may take too long to get started and making money! The #1 key to success in any business is knowing how to market the business, because both you and I could be armed with the exact same thermal camera and training, but whoever out of us has better marketing skills will go ahead in leaps and bounds and start banking money. Buy cheap camera -> Do level 1 certification -> Build a small website -> Apply some basic marketing ideas -> Learn on the job -> Bank money at the end of the day. It didn’t take long to work out that if I did 2 inspections per day at $300 a pop, that I would be on some seriously good money. Some days now I do 4 thermal house inspections. A couple of thousand inspections later I no longer need to use all the marketing ideas I executed because customers come to me. Do yourself a favour and take a read of the web page that describes the manual I’ve put together for people such as yourself who are looking to get started. Click the picture of the manual to the right of this message for more info.